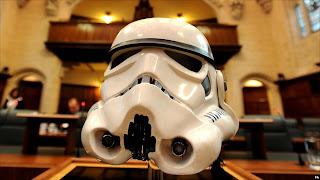 The Star Wars Stormtroopers® helmet case hearing started today at The United Kingdom Supreme Court. Listed for three days the case is about intellectual Copyright Property in relation to the helmet. An original Stormtrooper helmet was on display in the courtroom and will remain on display throughout the hearing of the case. Ken Bruen has (on Book Aware) listed his ten favourite crime novels. Unsurprisingly the late James Crumey's The Last Good Kiss has made the list along with The Friends of Eddie Coyle by George V Higgins. What made me smile with pleasure however was the addition of Megan Abbott's Bury Me Deep! Declan Burke whose blog Crime always Pays is essential reading for all things crime fiction especially Irish crime fiction has also published his ten favourite crime novels. His list can be found here. I was most pleased to see The Big Sleep by Raymond Chandler on his list along with L A Confidential by James Ellroy and Divorcing Jack by Colin Bateman. Val McDermid is due on Radio 4 to discuss the way real life violence has been dealt with in the work of a number of Irish crime authors. The programme can be heard on BBC Radio 4 on Tuesday 8 March at 11:30am. According to the Bookseller John Grisham has changed publisher. John Grisham has switched publisher from Cornerstone to Hodder & Stoughton who publish his Theodore Boone novels. The National Post have an excellent article where they take a look at Canadian pulp fiction and some new reissues. According to the Mid Lothian Advertiser Ian Rankin is attempting to create the biggest story ever told to celebrate this year's Stratford Literary Festival. He has penned the opening of Grab A Line, an online collaborative story launched by festival organisers. Ian’s opening contribution can be found on the Grab A Line website since Sunday 6 March 2011. The story will run until 25 April where it will be completed by another author. The Stratford Literary Festival runs from 25 April until 2 May. Fans of Harlan Coben and his Myron Bolitar series will love the new book Live Wire and to get you in the mood have a look at the trailer for the book below! The La Times has an excellent interview with Michael Connelly, which can be found here. In the article Michael Connelly talks about what it is like to see his novel The Lincoln Lawyer from paper to screen. Last year via Jen Forbus’s blog “Jen’s Book Thoughts” there was an interesting competition to nominate the 2010 World's Favorite Amateur Sleuth. This year it is being run again and the nominations are in. Have a look and please do vote! A report on the 2010 Courmayeur Festival by Maxim Jakubowski can be found here and makes for extremely interesting reading. The Times Oxford Literary Festival have two crime writers – P D James and Jill Paton Walsh taking part this year. The two authors will be debating the merits of Agatha Christie and Dorothy L Sayers as crime writers. Information on the event and how to obtain tickets can be found here. Writing Wrongs with Faber Academy!